A “Social Story” is a story used to model appropriate social interaction by describing a situation with relevant social cues, other’s perspectives, and a suggested appropriate response. a student has trouble with transitions, separation anxiety, etc. Review the story daily with the student before the routine is performed. After they learn it well, have them review it on their own before the routine is performed. Slowly wean them off it as they consistently perform the routine well. List the steps in the routine the student needs to work on. For each step create a simple sentence. Next to each step put a picture, image or graphic. Descriptive (where, who what, why) – Mondays I ride my horse. Perspective (opinions, feeling, beliefs of others) – My horse likes it when I am quiet. Directive (offers a positive response or behavior for the situation) – I will try to keep my voice down. Affirmative (enhance, reassure) – This is very important so I don’t scare my horse. Co-operative (identify how others may help) – My instructor will help me try to stay calm during my lesson. Control (provide personal meaning) – I like to ride my horse because it is fun. Partial (lets reader guess) – My horse’s name is ___________. Have their parent read the story to them at home, twice a day, every day, until the transitions become easy. Create options for the story as needed, such as if they have to ride a different horse, so you can let the parent know ahead of time and they can add it to the story to prepare the rider. Can make the stories into Velcro cards that stick onto a sheet, which are pulled off with the completion of each one. For new riders send the social story to them before they come in, so they are prepared for the first day, then afterward revise it and come up with particular story for their situation. Try to use photos of the child themselves. Click on this link for an example from the 2014 Path Intl Conference Seminar “Dynamic Collaboration: Maximizing Communication During Therapeutic Riding” – scroll down to page 6! From Carrie of HorsePower, this is a Social Story they use (she sent this to me and inspired this post!). She says “Typically, we try to also use a photo of the child, but this one did not. 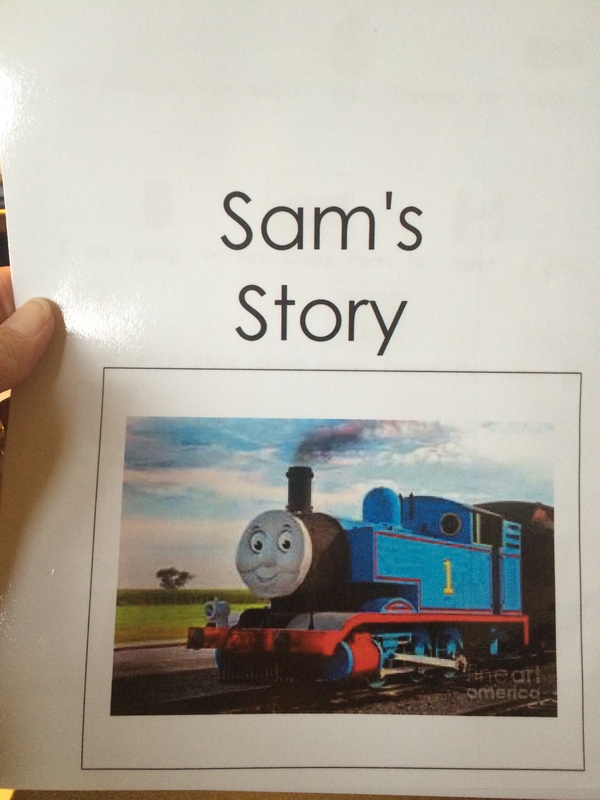 … We have a speech pathologist who volunteers to create our social stories using Boardmaker software.” Thanks for sharing, Carrie! “Dynamic Collaboration: Maximizing Communication During Therapeutic Riding” presentation at 2014 PATH Intl Conference, by Karyn Lewis Searcy, M.A. CCC-slp and Director of Crimson Center for Speech & Language, and Kaitlyn Siewert of R.E.I.N.S. Therapeutic Horsemanship Program. Thank you for providing detailed outline of interventions through this blog series.